Born June 26, 1878, in Edinburgh, Scotland. Torrence came to America from Scotland. He was a veteran of the stage, and it was actually one of his stage performances that led to his first film role as the brutal Luke Hatburn in "Tol'able David." 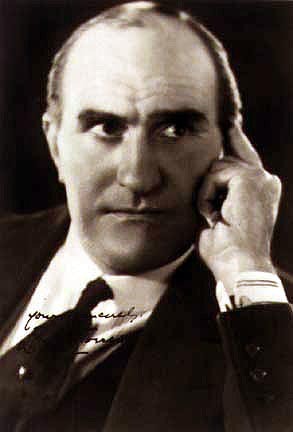 The film's director, Henry King, saw Torrence perform on Broadway in 1920, and selected him for the role. He was an immediate hit as Richard Barthelmess' evil nemesis. Just as intensely as they had hated him in "Tol'able David," audiences fell in love with him as the crusty veteran of the plains, Bill Jackson, in "The Covered Wagon" (1923). Although the film boasted many stars such as J. Warren Kerrigan, Lois Wilson, Alan Hale and Tully Marshall, it is Torrence who consistently gets the acting honors in this film. As the tobacco-chewing best friend to Kerrigan's character, Will Banion, Torrence gets to play a tough guy when he urges Will to go ahead and gouge Sam Woodhull's (Alan Hale) eyes out in a "free" fight and a comedian when he begs Will to let him throw Woodhull back in the quicksand from which he was just rescued. He was cast as Captain Hook in Betty Bronson's "Peter Pan" (1925). James Card, author and founder of the George Eastman film archive, said, "And Ernest Torrence as the 'not altogether unheroic' Captain Hook after his triumph as the dust-encrusted scout of 'The Covered Wagon' was brilliant casting." In "Mantrap" (1926), he plays a lovable backwoodsman in need of a wife. The most unlikely coupling imaginable comes about when Torrence's character marries city girl Clara Bow. Even in a role such as this, Torrence could switch convincingly to a menacing hulk of a man in a moment's notice when he goes looking for his errant wife and the man with whom she has run off. In the end, she realizes she really loves him and comes back to him, and, somehow, Torrence makes us believe this is possible. His performance as Steamboat Bill in Buster Keaton's "Steamboat Bill, Jr." (1928) is a gem! Torrence was a master at portraying frustration (he did this well in "The Covered Wagon" at Will Banion's reluctance several times to go ahead and "finish off" bad guy Sam Woodhull). Again, he's a crusty old coot who is constantly frustrated at his attempts to make a man out of his son, portrayed somewhat effeminately by Keaton. He means well, though, and you can't help but love him. Some of Torrence's other films include "The Hunchback of Notre Dame" (1923) with Lon Chaney, "The King of Kings" (1927), "The Ruggles of Red Gap" (1923), "Twelve Miles Out" (1927) with John Gilbert, and his final film, "I Cover the Waterfront" (1933) with Claudette Colbert. Torrence died in New York May 15,1933, at age 55.